Looking for fun things to do in Kansas City this weekend? Families can find TONS of Kansas City attractions & things to do with kids. Whether you live in the area or are planning a weekend trip, there is no shortage of fun activities you can enjoy. Explore Kansas City museums, walk the Country Club Plaza, or …. KC has something fun for everyone. There are also great places to take family pictures around town! Union Station offers some of the best things to do in Kansas City. Their hands on exhibits bring a new and interesting to the experience with each visit. Multiple exhibits give your family hours of things to do inside Union Station. There is also the Reigner Extreme Screen Theatre, where you can watch new movies on an EXTREME screen! Pro Tip – Union Station members receive a hefty discount on exhibits. Take advantage of the perks! Science City is easily one of the top Kansas City attractions for kids. Each of Science City‘s three stories offers fun, exploration, and education for children (and adults) of all ages. Your family will have the opportunity to learn about alternative energy sources, take a ride on a bicycle suspended on a wire, dig for “fossils”, test their strength with the giant lever, explore the universe, and more during your visit. Pro Tip – Reserve a spot in the test kitchen to give your kids the chance to learn the chemistry in the foods they eat. 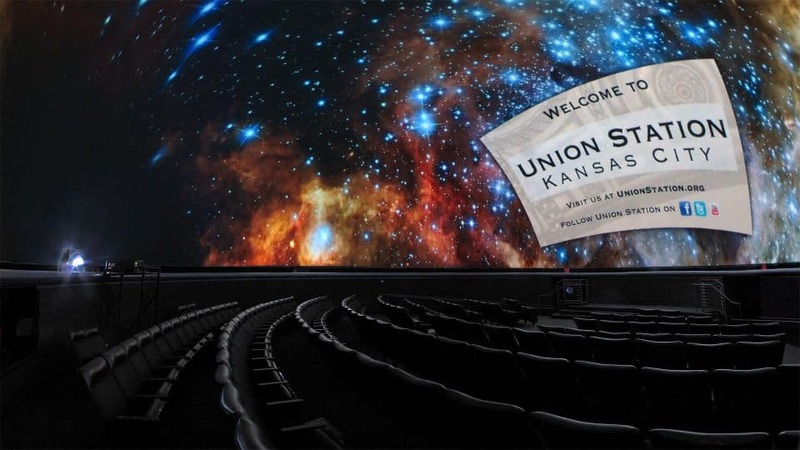 Located on the bottom floor of Union Station (near the exhibit hall), the Arvin Gottlieb Planetarium is an incredible resource to discover the joys of astronomy. Take a guided star tour or explore space through one of the fun movies. Laser light shows are also popular at the planetarium. The list of all available music light shows & presentations can be found on their website. You definitely do not want to miss this. Pro Tip – Get there early, they have two very comfortable cushions that are ideal for your stargazing adventure! Easily one of my personal favorite spots in the downtown area, the National World War I Museum offers incredible insight to one of history’s most critical times and the most incredible views atop Liberty Memorial. During your visit, you’ll see real life artifacts from the era, learn about our nation’s (late) role in the war, and the impact it had on the world as a whole. Admission includes a two day ticket so you can take in both the educational experience inside the museum as well as the stunning views at the memorial back to back during your visit. The museum provides educational things to do in Kansas City, so be sure to support this great organization. Pro Tip – Hands On History (where you can see touch real artifacts from Word War I) sessions are included free with admission on select Saturdays. You can also climb the Memorial Tower Free. Kaleidoscope is a free things to do in Kansas City. The creation center offers children the opportunity to create, explore, and design works of art using leftover materials from Hallmark. It’s a fun place to let your child’s creativity and imagination shine and has offered our family Scountless hours of fun over the last few years. Be sure to check their schedule online as they do fill up and space is limited. Ages – Great for kids of all ages. Primary school aged children will love this! Check out our Museum Guide for a list of the Best Kansas City Museums. What better thing to do than ride roller coasters & tummy turning rides? Every kids loves a fun amusement park, and Kansas City has just that. Worlds of Fun offers tons of fun rides, water activities, games, delicious food, & more. Hours – Open seasonally, check website for updated hours. Mesner Puppet Theater is a non-profit professional puppet theater is located in the downtown area at 31st & Troost and aims to stir creative imagination through classic, folk, and contemporary plays for children and adults. These exciting performances are so unique and fun. Their list of upcoming performances is available on their website and extends into next year. The engaging shows provide fun & cheap things to do in Kansas City. Kansas City has so many fun things to do, but what better than exploring nature? Whether you want to find a huge playground for the kids, or a large open space to enjoy the afternoon. Our list of Kansas City parks & trails has the perfect place for you. Loose Park is definitely one of our family favorites. This fun Kansas City attraction is home to a large variety of animals & the first all-inclusive play area in an American zoo. Come say hi to the monkeys, ride the African Sky safari, or one of the other fun rides at the zoo. They have tons of special animal experiences like the Penguin Encounters & Twilight Tours, as well as daily activities like zookeeper chats and animal shows. The museum is a fantastic free thing to do with kids. Your family can explore the many exhibits & wide variety of artists featured. There is also a large walking trail around the museum with outdoor sculptures & artwork. Arguably one of the BEST things to do in Kansas City…of all time. Enjoy a baseball game at Kauffman Stadium with the family! The laid back environment is a great way to enjoy Kansas City & be surrounded by a sea of blue. Check the website for the full Royals Schedule & game times. Price – Ticket prices vary by game & seat location, but can find tickets for $18. If your dates are flexible and you’re interested in exploring Kansas City’s Power & Light district with your family, Sprint Family Fun Days offers the perfect opportunity for you to do just that. These fun days take place on the second Saturday of each month (May-October) and provide entertainment, activities, and more for children and families of all ages. Pro Tip – Start your day at River Market and take the Streetcar to Power & Light to avoid congested traffic. One of the most fun museums for kids, The College Basketball Experience at Sprint Center lets you step inside basketball for hours of fun and activity. CBE offers more than 41,000 square feet of highly interactive, fun exhibits for guests to learn about the incredible contributions made in men’s collegiate basketball. Exhibits include the opportunity to participate in game-like situations and announcing at the ESPNU broadcast desk. Price Point – Youth $12, Adults $15. Looking for a great place to get active? This is one of our favorite places to hike. It has a lot of fun attractions for the kids including the cascades, cave, & chimney ruins. There is no shortage of things to do or explore at Cave Springs, so your day will be filled with outdoor adventure. Looking for unique things to do in Kansas City? Martin City Melodrama has served the Kansas City community for 31 seasons. In addition to their fun line up of family friendly shows, they also offer Kids Komedy camps and other great activities for children who are interested in performing arts. Pro Tip – Reservations are essential, space fills up quickly! There is a wide variety of shows, orchestras & movies played at the center. Check their website for update show schedules & descriptions. This is definitely a must do Kansas City attraction. There are great things to do in Kansas City to get your family active. The Tower Tour is over 1 mile long of 5 lines running tower to tower and reaching speeds up to 50 mph! Fly through the trees of KC & see the outdoors in a way like never before. Experience their breath taking zero gravity line which features a 12 ft free fall before the zip line swoops you up like a roller coaster to end your adventure. Hours – Vary by time of day & season. Check website for tour details. Ages – This attraction is great for kids, but not ideal with toddlers or infants. This is a GREAT free thing to do with the family. There are tons of vendors & the market is open year-round. During warmer months, there are huge farmer’s markets on the weekends. Don’t miss out on this unique Kansas City attraction! SeaLife Kansas City is a fun, interactive experience for children and adults who appreciate the creatures that live in the sea. During your visit, your family will have the opportunity to get their hands on critters, learn about fascinating sea life, and enjoy the fun of hands on exhibits. Pro Tip – The attraction stays open two hours after the last admission so don’t worry if you don’t arrive until 4pm on a Thursday, you’ll still have time to get it all in! Located next door to SeaLife at Crown Center, Legoland Discovery Center is a fun place for the kids. From 4D animated movie adventures on the big screen to the rides, play area, and legos everywhere this attraction has something for everyone. Your family will enjoy building and playing together inside Legoland’s expansive facility. Check out their website for special activities and adult only events for Lego fans of all ages and stages. Combo passes to both SeaLife and Legoland can be purchased so that you can enjoy both attractions at a discounted rate. Whether you’re visiting the area for a few days or you live close by, there are so many fun, free, & fantastic things to do with kids.